This is a commission slot. You can hire megamint07 to create a personalized artwork of this sort here. The artist will most likely respond to a request within 8.9 days. This commission slot was rated positively by 19 clients thus far. There is no limitation in revision (only for sketch). 223.50usd is for 1 character, not couple. Love the work done for me, very happy. So absolutely fantastic at their work and creative enough to take control where needed. Despite the internal issues from the site; Mint still delivered at a respectable time frame. Not only that, but the product delivered is 10/10 beautiful. I am very happy with the results and would recommend any of my friends to this style. Thank you very much! Was very responsive and pretty quick. Quick and easy, very willing to offer revisions (we didn't need any). We love the piece! Thanks so much! The wait was absolutely worth it for what I received from Megamint. yet another excellent job, very happy with the outcome. Perfect work, no complaints, speedy delivery. What more could be asked? A fantastic, fast working, and friendly artist. I thoroughly appreciated how responsive they were to edits to the piece, and it came out even better than I had hoped. 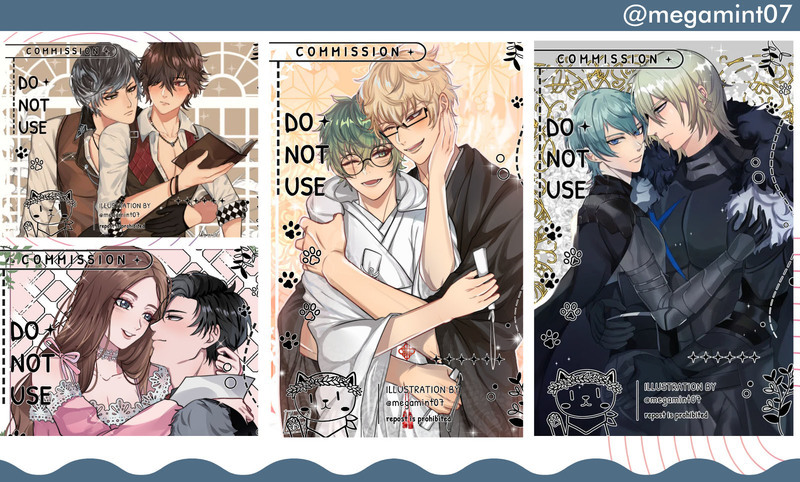 I would highly recommend commissioning them! Commissioning from this artist was a blast and the art turned out better than I could have ever expected! Polite, quick and eager to please the customer. I've no regrets from ordering art here. Hey, if you're looking for great art and artist that you want to be creative with here's the artist for you. I'm very pleased with how it turned out. The artist proved to be effective and was very communicative throughtout the whole thing! A marvelous experience! The artist worked fast and got pretty much what I wanted exactly from the start. Can't recommend them enough. My commission was complete quickly, and while Megamint offered revisions, I didn't need them as I was pleased with the art I received. I will definitely commission another piece from them in the future! Artist was extremely quick, good quality, and managed to give me something close to my vision on the first try. -You can pay me fully after I sent you the finished sketch.